Here are homes for sale near the Booth School of Business at the University of Chicago in downtown Chicago and Hyde Park. Schedule a showing online! If you’re considering attending the University of Chicago Booth School of Business for a few years, purchasing a home nearby may make sense for you. With all the studying you’ll be doing you might as well minimize your travel time to and from classes. The school has 2 campuses here in Chicago, one downtown and one in Hyde Park. 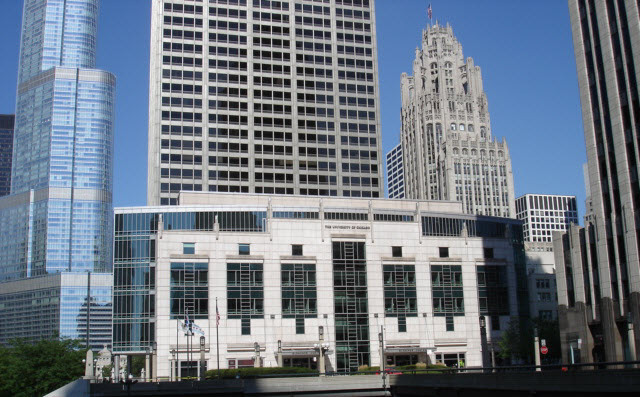 The Booth School of Business downtown campus is located at Gleacher Center at 450 N Cityfront Plaza Drive in the Streeterville neighborhood. It’s one block east of Michigan Avenue and just north of the Chicago River. The homes for sale within a half mile of the downtown campus are all condos. There are no houses or co-op apartments. They are located in the Streeterville, Loop and River North neighborhoods. This area is also convenient for people who want to live near Millennium Park, the Magnificent Mile, Northwestern Memorial Hospital, Chicago’s Theater District or Navy Pier. The Hyde Park campus is located at the Charles M. Harper Center at 5807 S Woodlawn. It’s on the east side of the main University of Chicago campus. The homes for sale near the Booth School of Business Hyde Park Campus are more mixed with condos, co-op apartments and houses. Condos and co-op apartments are much less expensive here than those downtown.